I haven't posted anything in a while because I am teaching this semester (Earth Resources and the Environment), which has made me incredibly busy, and also I was playing a computer game for the past month. Anyways, some friends told me they actually read this, so I am gonna start up again. Today we discuss how wind power works, how a wind turbine works, and limitations on placement of wind turbines. 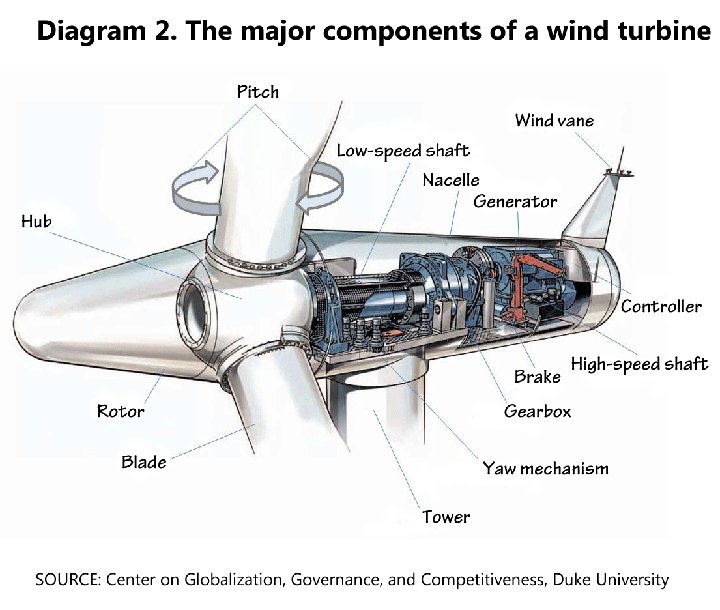 Block diagram of a wind turbine. Wind spins the blades, which in turn goes through a transmission to spin a turbine to produce electricity. Wind power harnesses the power of wind to turn a turbine. 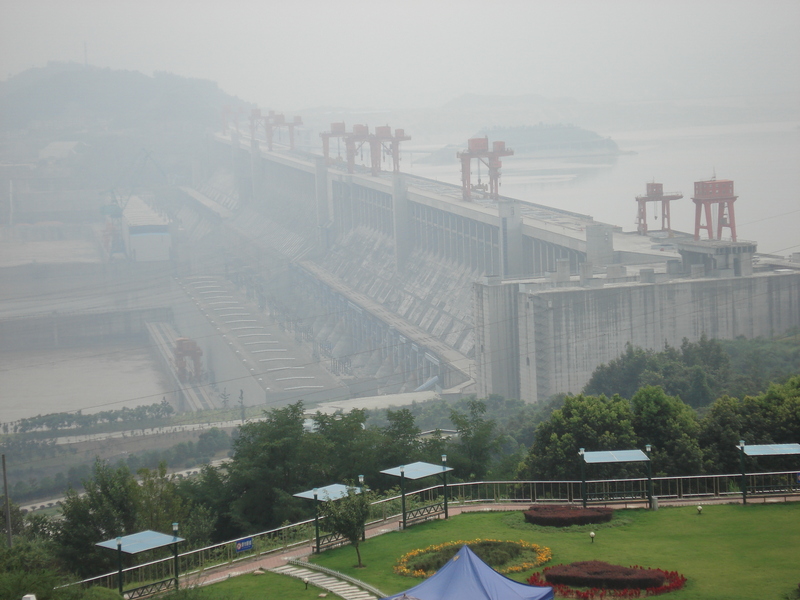 Unlike every other power plant we have discussed, this is not a thermal plant. How does wind even happen? As we all know, the sun shines more directly near the equator than it does the poles. And so the equator is heated more than the poles. The Earth doesn't like having one part heated and another not, so the major prevalent winds are the way the Earth redistributes this uneven heating from the equator to the poles. Smaller winds are local manifestations of this phenomenon. In short, wind power is extracting the energy deposited by the sun. The rotors of a wind turbine catch the wind, and thanks to Bernoulli's principle, the wind forces the turbine to spin. Think of it as creating an area of low pressure behind the blade, so the blade is getting sucked, or pulled, rather than pushed in a circle. These blades are attached to a hub, which spins with it. The entire box behind the turbines is called the Nacelle, and contains all the parts that produce power. The hub itself spins somewhat slowly, but thanks to a gearbox, the shaft that goes to the generator spins much more rapidly. The windvane senses the wind direction, and a motor beneath the hub rotates the entire turbine to face directly into the wind. This photo from NOAA uses LIDAR to track the turbulence produced in the wake of wind turbines. It visually depicts the limitations of putting turbines in the same place. The turbulence behind the turbines can damage the props on the next turbine, requiring further replacement. It also reduces the efficacy of the next turbine. link to NOAA. Ultimately, the largest problem is where to site wind farms. You can't put them in places without wind, or you spend a ton of money on them and they don't return the payment. This map indicates regions and their use for wind farms. It shows that many areas are not great for wind farms. Click the link for a more detailed image. There are two closely linked issues associated with wind power. In most places, wind does not always blow. When the wind is not blowing, power cannot be extracted. This is called intermittency. It means that wind power cannot provide baseload power. In some places, like California, the intermittency is dealt with by power up peaking gas-powered power plants. In other places, the intermittency is seen as an insurmountable issue (California surmounted it. Those other places are foolish.) Other methods of dealing with it are compressed air storage (more on that later), batteries, and pumped hydro (more on that later). Another important feature of wind turbines is size. To get more power from a single turbine and reap larger economies of scale, you build a taller turbine. Also, taller turbines reach farther up into the part of sky where wind it a bit more constant. But those huge turbines, that can produce up to 5MW each (recall a larger power plant is 1000MW), are relatively new. We are not sure how long they last in the wild. Maybe 50 years (like a normal power plant) or maybe 20. This is important, because per MW, wind power used more resources to build than almost anything else. Now, offshore wind is a different beast entirely. Offshore wind turbines become progressively more expensive as you move to deeper waters. These things need to be moored to the ocean floor, or have very expensive floats. It can increase production cost by a factor of three. Ameliorating this fact is that wind is often more consistent offshore. But these things face waves, corrosive ocean water, severe storms, etc., and need to be built very strong, increasing costs. Moreover, they need a way to connect them together, and then very powerful regional lines to transfer the power to mainland. Expensive. If you remember my post comparing the cost of nuclear power to other types, offshore wind is mad expensive. Another interesting point about wind power (and solar): they produce DC power. This is direct current, like a battery. The power we get from the wall is AC power. It alternates. Anything with a motor likes AC power a lot. Many electronics prefer DC power, hence needing AC adapters for all your electronics. Batteries use DC. Another fun fact about AC vs DC? Electricity make your muscles constrict. If you grab something with AC, since it alternates you let go. You grab something with DC, like a car battery or a taser while being arrested, that stuff causes constriction and you can't let go. Point is, stay away from DC electricity. Back to the point: Somewhere in the process, whether at the turbine or at a collection station, this electricity needs to be converted to AC to use on the electrical grid. More expenses. In short, offshore wind is incredibly expensive, and only for countries that are afraid of nuclear power. In a later article, I hope to compare the resource costs per MW of constructing each of these types of power plants.